Len Williams has his own website here with more details, and you can contact him there. I had to smile when I saw Len's website with this neat little system. Lightweight 25 x 25 RHS is real handy stuff. I can imagine knocking up a quick and easy shade house with the elbo system in no time. A hack saw, some tek screws and a drill. Couldn't be easier. 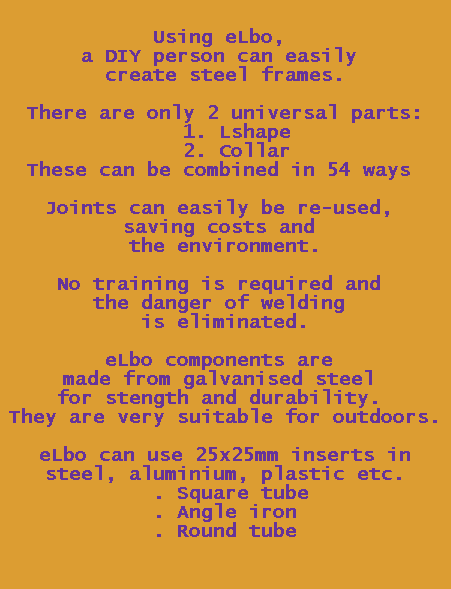 Leave this elbo steel frames page and back to home.